For my final project, I have been working to create a beer tap handle that will incorporate a dynamic lighting effect. 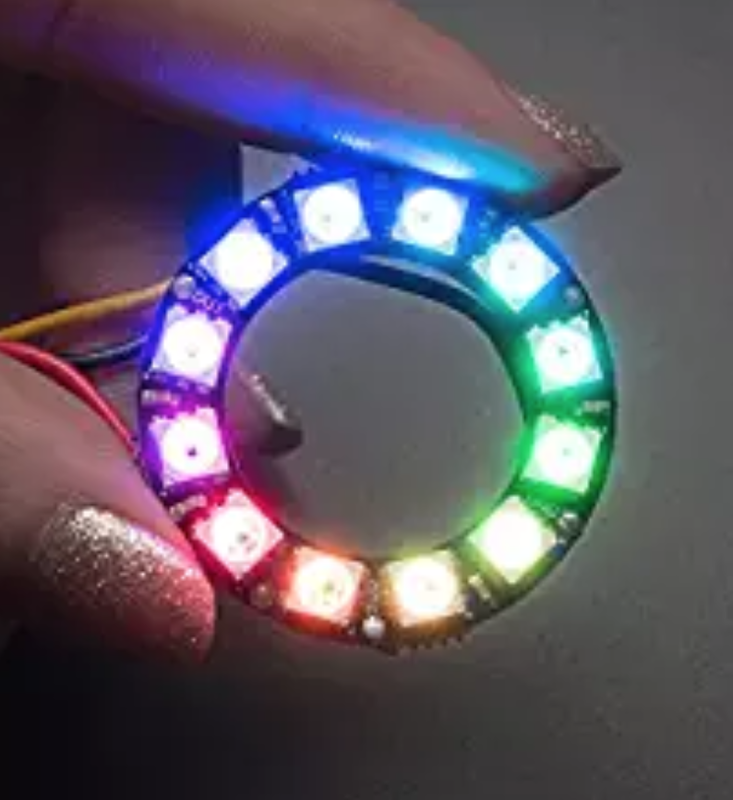 To achieve this lighting effect, I have purchased an Adafruit Neopixel ring and an Adafruit trinket Arduino microcontroller to control the lighting effect. My main constraint going into this project though is the aesthetic. I decided that I would like to create the tap handle to conform to the aesthetic of a beer brand, which could be an actual brand or one I choose to create. As of right now, my best running idea is a beer called Lava Lamp Lager, and I will work to create a tap handle that recreates the aesthetic of a lava lamp. I am open to suggestions though, as I would enjoy creating a handle for an actual beer but have had a hard time finding ones without existing tap handle designs. To create this lava lamp effect, I think incorporating the light to make the lava glow will be the source of my dynamic lighting. For optimal optical clarity, utilizing a resin mold for the body of the lamp will be the best method, and I will insert some object (possibly 3D printed shapes) to give the illusion of the lava flowing through the lamp. Once I model the body of the lamp, I will print it utilizing the resin printers in the ITLL to create a smooth mold for the resin. Printing the parts in ABS and utilizing acetone vapor smoothing to create a seal on the parts. ABS reacts to acetone in a way that partially degrades the plastic in a “melting” way, allowing the parts to smooth over the layer lines and create a waterproof seal. I have never utilized this method before, so it may be a risk to undertake something new. Overall I think I’m at a good place with my design, the trouble will be the execution. I am looking forward to the challenge and sharing my design! I like how you continued the tap handle idea from the previous project. This will be very different from the original project and it will serve a more functional purpose. I’m excited to see the final results and possibly use it! This is a really cool idea! It’s really unique and seems like you’ll get a lot of use out of it. I particularly like the lighting aspect, as I am doing something similar. Good luck! Great idea and project. It will definitely be a challenge to pull off, but that is good. I’m excited to see it! I think there could really be a market for this if you wanted to pursue the idea further! Great work so far! Great idea. I think molding will be challenging but really fun to do! I think you will be able to find video instructions easily. I think since you’re using 3D printer, you may want to use the one in the idea forge instead of the ITLL. Good Luck! The weeping willow idea is quite fascinating, but I agree that this is quite advanced. The molding and ABS chemical interaction sound very cool though. I think posting the process of the various iterations would be interesting. I am excited to see how this turns out. The dynamic lighting effect is fascinating when it attached on a Beer Tap. I wonder if you can create a function to control the lighting. I like this idea! I’ve never seen a glowing beer tap handle! This will be very cool and maybe you can turn it into a commercial product in the future if it works out. Can’t wait to see the final product! Chris, I’d love to try your lava lamp lager. I think you should try the acetone vapor melting. It creates a nice, different surface texture and you could probably test it out with a different print first so you don’t mess up your final project. I like your use of many different processes (3D printing, mold making, epoxy casting, and surface texturing) to create this. Interesting idea. Mold making seems like it will be tough to do but very cool. Are you going to be using silicone mold or which material? I like the inspiration from lava lamps. That’s really creative. It is clear that you have put a lot of thought into this project. Have your thoughts what kind of shape you’ll have the mold in? I’m excited to see the final results! Christopher, This idea is so exciting. I hope that it turns out well. I was wondering how you planned to use the tap in your house and if you are actually planning on keeping it full.